This page will walk through Angular 2 select option + multiple select option + validation example using template-driven form. We will provide end to end demo for how to populate select option and multiple select options. In Angular select element, the value attribute of <option> element can bind to complete object using property binding and one field of the object can be used to display items. For validation of select element, we need to use validation attribute such as required. We can get validation state like valid and invalid using local template variable. Select element is written using <select> tag and multiple select element uses multiple attribute as <select multiple>. By default select element compares two objects using object identity. If we want to change the default behavior, we need to use compareWith input in select element. Now find the complete example point by point. Find the project structure of our example. Angular provides following directive to use <select> element in our form. The above directive works for both module FormsModule and ReactiveFormsModule. It writes values and listen changes for select element. Now find the following steps to use <select> element. Step-1: Import FormsModule using imports metadata of @NgModule decorator in application module. Step-2: Create an array of data that will be displayed in <select> dropdown. For example we have created a domain to store data. Now create an array of Profile class. Step-3: Now find the <select> element. Here we will iterate our array allProfiles to populate data in dropdown. To assign value to option element, we need to use ngValue property. We can assign our object to ngValue using property binding. Now find the code snippet to use <select> element. 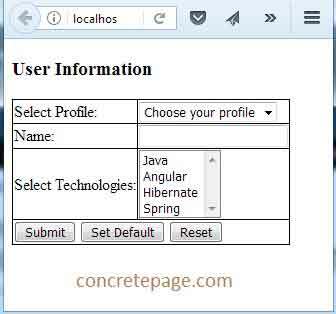 We need to provide name attribute in <select> tag using which we will access its selected value on form submit. To register our <select> element with NgForm, <select> must have ngModel attribute or one/two way binding with ngModel. Step-4: On form submit we can fetch the value of selected data using the instance of NgForm. Suppose the form is the instance of NgForm, now we can access selected value as follows. In the <select> element we have populated complete object of Profile class. So when we select data, we get complete Profile object. We can also fetch selected value using two-way binding with ngModel. userProfile will give selected value. Angular provides following directive to handle multiple selection option. The role of above directive is writing a value and listening to changes. It works for both module FormsModule and ReactiveFormsModule. To enable multiple selection, we need to use multiple attribute as <select multiple>. Find the steps to use it. Step-1: Create an array of data that will be populated in multiple select option. For example we have a class as follows. Now create an array of Technology class. Step-2: Find the code snippet for <select multiple> element. <select multiple> must have ngModel attribute or one/two way binding with ngModel to register with NgForm. The elements from allTechnologies array will be populated and a user can select multiple values at one time. Step-3: On form submit we can fetch multiple selected values. Suppose form is the instance of NgForm. Now find the code snippet. We can also fetch selected values using two-way binding with ngModel. technologies will be an array of all selected values. Select option binding can be achieved by one/two way binding with ngModel. Suppose we want following value selected as default. Then perform select option binding as follows. We can achieve select option binding for default value in <select multiple> element in the same way as above using one/two way binding with ngModel. Find the code snippet. To validate select and multiple select options, we need to use validation attribute with them such as for required validation we need to use required attribute in <select> element and <select muliple> element. We can use local template variable to fetch validation state. Local template variable can call following boolean properties to know validation state. 1. When touched returns true then untouched returns false. 2. When dirty returns true then pristine returns false. 3. When valid returns true then invalid returns false. We can use above values with local template variable. Now create the local template variable in select and multiple select options. Find the code snippet for <select> element with required attribute. #profile="ngModel" is creating a local template variable named as profile. We can get validation state with local template variable such as profile.touched, profile.invalid etc and they will return boolean values that can be used for validation message. The validation message can be printed as follows. In the same way we can use local template variable with <select multiple> element. Find the code snippet of <select multiple> element with required attribute. #selectedTechs="ngModel" is creating a local template variable named as selectedTechs. We can get validation state with local template variable such as selectedTechs.pristine, selectedTechs.valid etc and they will return boolean values that can be used for validation message. The validation message can be printed as follows. Angular uses object identity by default to select options but in some scenarios there can be discrepancies when object values remains same but object identity is changed. "Angular uses object identity to select options. It's possible for the identities of items to change while the data does not. This can happen, for example, if the items are produced from an RPC to the server, and that RPC is re-run. Even if the data hasn't changed, the second response will produce objects with different identities." To handle such scenarios, angular provides compareWith input with <select> and <select multiple> element. We will bind a method with compareWith to change default logic of object comparison. Find the code snippet. Find our custom object comparison logic, normally id is unique, so we can build our identity comparison logic using data id as follows. To test the this feature in our example, set values in <select multiple> element and we can see that our compareTech() method will be called. Select option change event is called when selection of item is changed. Change event is used as follows. Now find the method that will be called on change event. To run the application, find following steps. 1. Download source code using download link given on this page. 2. In your angular CLI application, replace src folder. 4. Now access the URL http://localhost:4200 . Find the print screen.